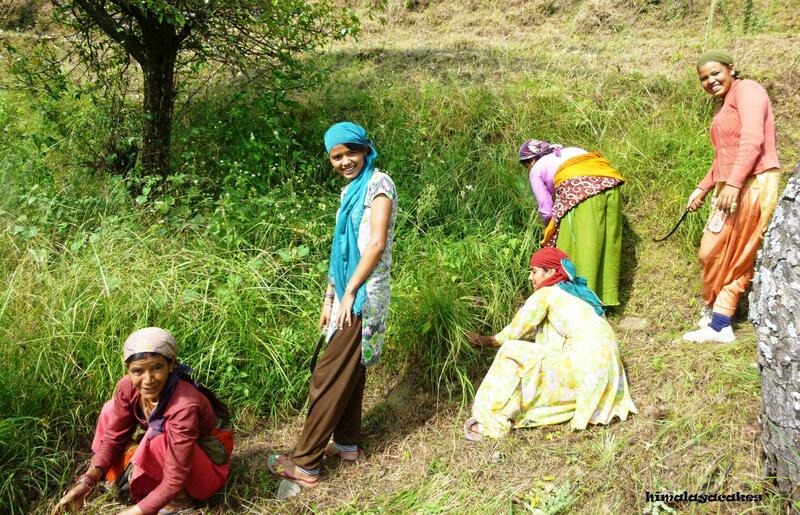 Every year in September it’s officially “Grass-Cutting-Season” A beautiful and cheerful time up here in the Himalayas. First of all, the women of the surrounding area gather for a grass-cutting-council. They organize who will help to cut whose grass on which land. The grass prices are extensively discussed and eventually settled. Some may wonder why there is so much fuss about something as trivial as grass. Up here we are talking about a very valuable natural product. The mountain side is dry and barren during the winter months and every family has to make sure that there will be enough hay available for their cows, buffaloes and goats. Soon after all the organizing part is clear, the ladies set themselves to work. In the steep hillside no machines can be used. Crouching on the ground to cut grass by hand with a sickle and then transport a huge bundle of it on the head is a very hard job. On top of it the women also climb high on trees to hang the grass there to dry. Nature turns into a big barn and whenever pasture is needed in the winter, they go back to the trees to take of the necessary amount. 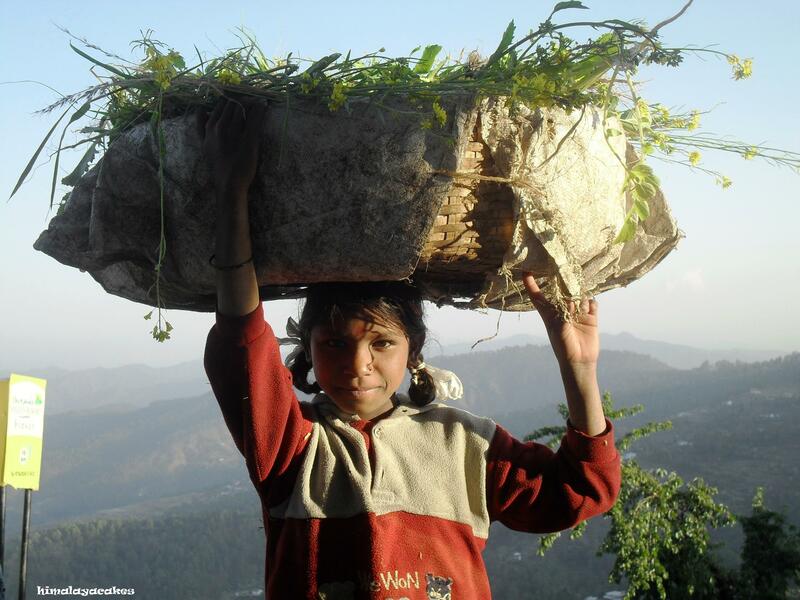 When I first saw women sometimes double my age carrying the heavy load on their head up the hill, I was torn between a feeling of pity and deepest admiration. Women here are amazingly strong in all senses! To be honest, most of the time I already struggle with my own body weight when I walk up the mountain; (don’t tell anyone!). My feeling of pity soon dissolved, as I realized that all of them, no matter how young or old, are really looking forward to the grass-cutting-season and indeed enjoy it a lot! It actually seems to be some kind of women’s circle, where they charge themselves with the energy of Mother Nature. It’s a time to teach, learn, chat, gossip, and exchange grass-cutting-stories not only during a well deserved Thermos chai break; stories about babies being born on the field, snakes and leopards. They are rightly proud of how high and good they can climb and of how much weight they are able to carry. When they come back from a day of work, they look tired, but happy with a lot of hay in their beautiful black hair. When I meet them, they always ask me seriously, but half laughing (…an Indian thing…) to come along with them with my sickle. Before I didn’t get very much the Indian sense of humor and replied with excuses like not having land, cows, sickle, time or whatever. Now I just answer that I’ll be there in a minute with my tool; sometimes I say so ten times a day. I love to observe the women working in the fields. Sometimes even in the form of colorful spots through a curtain of rain. Instead of going home, they cover themselves with a piece of plastic to keep themselves dry and keep on cutting. But the same season also turns me sad somehow, as the landscape turns from green into brown and Grey again. I also found out that it somehow affects my mood. It probably has to do with the general change which comes along with fall and the slowly inwards turning energies. Mid September here marks also the beginning of the cold season. 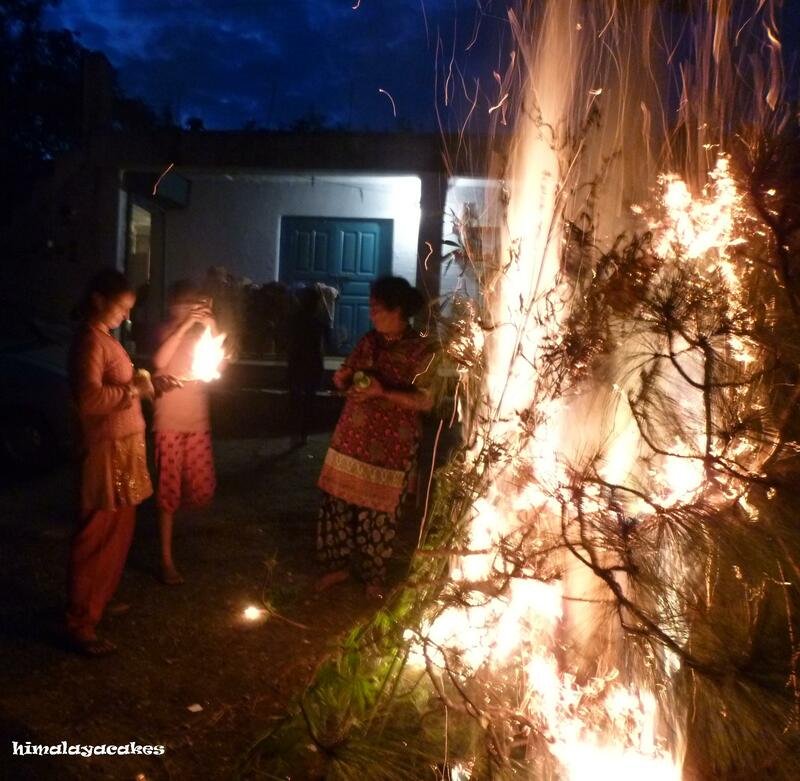 Last week the corresponding ritual took place: On the night in question, women light a big fire in front of their homes and feed it with some cannabis branches as an offering (by the way, the cutting of this “grass” happens in October) and share a cucumber as prasad (blessed food). In their prayer they ask the coming winter not to be too much cold and cruel. From that moment on the cold season has been officially declared, accepted and who knows, maybe even invited. At least I don’t really understand how they do it; but every year right the next day after the ritual there is a major drop in temperature, frequently accompanied by cold rain. Sometimes I forget the life-giving and nurturing force of the powerful and sometimes equally destructive monsoon. I left a bone-dry landscape when I departed to Europe and found a stunning, lush green scenery after my return to our Himalayan village. My garden had turned into a wild jungle and the young trees had visibly been growing taller in a very short time. Due to the high grown grass we had a lot of leopard presence lately. They seem to feel more secure, as the thicket allows them to hide themselves easily. They also turned bolder when it comes to approaching houses in search of easy prey. One night Baba drove home from our coffee shop late at night, as usually together with our dog Lamboo who used to run along with him right next to the motorbike. The guest who was staying at our house at that time was sitting behind Baba. 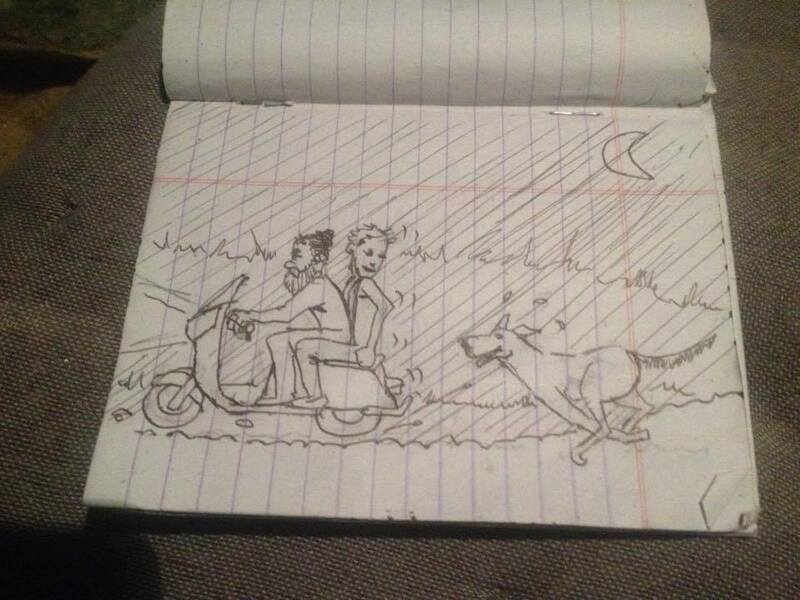 They had almost reached home when Baba saw a leopard lurking in between the grass on the road side and in the blink of an eye Lamboo was suddenly gone! I could hear the howling down to our house. Our guest did not see anything from his position and as he is deaf, he did not realize what had happened until they reached home, where we explained it all to him with the help of gestures and scribbling notes on a piece of paper. He was shocked! They decided to drive back and see if the dog had survived and was maybe lying injured somewhere in the bush near the dirt road, but no trace. Lamboo was the fourth dog we lost to the leopards in seven years! Each time I tell myself that I do not want anymore dogs, but then, when they just pop up out of nowhere and look at me with their big brown eyes, I get weak and decide to give again a happy, but short life to one or two of them. After this incident the leopard kept on sneaking around the neighboring houses after dusk for several nights and people would throb on steel plates or light a fire in the garden to drive him away. Some say that they saw several leopards roaming together. Maybe it was a mother with bigger cubs, as they are usually solitary animals. Like every evening, I was sitting in the bed with my daughter reading her a bedtime story; ironically this time she had chosen “The Jungle Book”. Lamboo was still alive at that time and while we were reading the chapter where Mowgli fights the tiger with a stick on fire, our dog all of a sudden started barking like mad. From the bed I peaked through the window to find out what was going on. I could hardly believe my eyes when I saw a huge leopard sitting right next to my bedroom window! My first reaction was to scream as if possessed by the devil. The gate was open and brave Lamboo was only a few inches away from the cat. My outcry made the leopard look up and his hypnotizing green eyes stared right into mine. Then, with a big leap, he disappeared into the night. 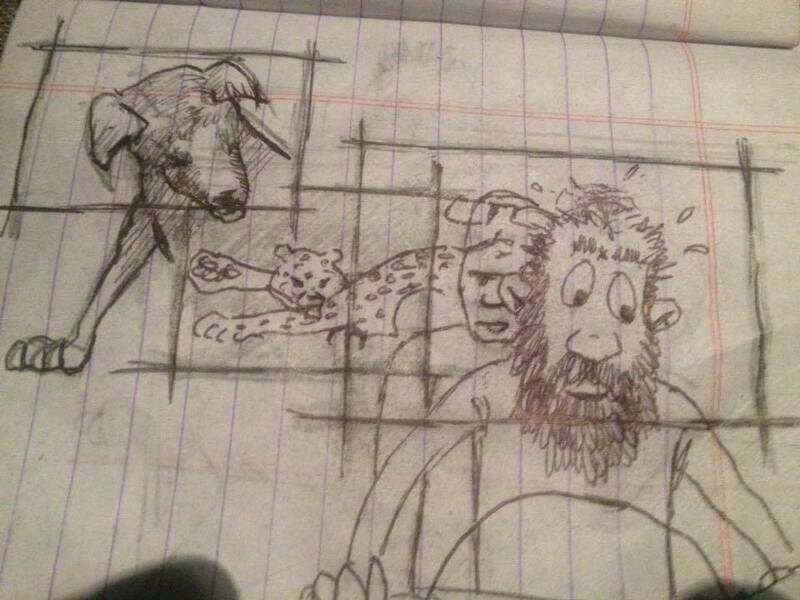 By the time Baba had run out to the porch, the leopard had already vanished, but at least he managed to keep the dog from following him. The whole situation lasted only a few seconds, but it seemed like an eternity to me. I felt horribly vulnerable and shivered with fear. The fact that these animals come that close to a house, even with the outdoor lighting on, was almost more scary than the happening itself. From that day on I made sure to not let my child play outside in the late evening and to keep the gates closed. Usually leopards go for goats, dogs or other animals, but who knows, a child might look equally tasty to them and on top of it, easy to catch. Before that, I even used to enjoy sitting on the porch to listen to the very special roar leopards produce, when they occasionally roamed the area at night. 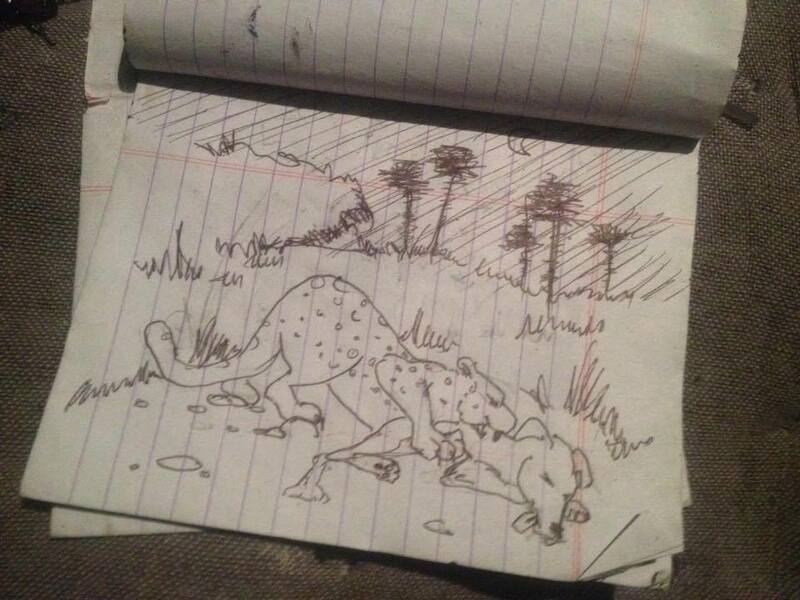 I do not blame the leopards. They are just wild animals which like any other being in this world need to somehow satisfy their hunger. They were always here and now find every time less space where to live and hunt. There is not much natural prey left for them in the area we live in. As far as I know, there are only pheasants and monkeys. 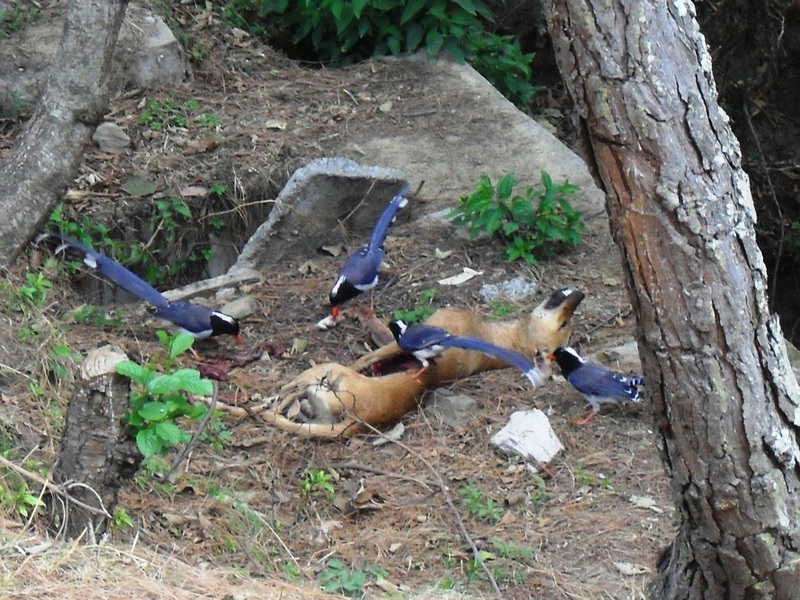 The birds might not be enough to fill a big cat’s stomach and monkeys I imagine are not very easy to catch. Not long ago I have read about a project by the Uttarakhand government, which consists in counting the leopards in each area of the region and return deer to the wild to keep the cats from coming to close to humans. Hopefully something will happen soon. I think it is worth a try, even with the consequence that the deer might feast on the precious grass meant for the cows during winter time and the crops for which the village people have to work really hard every year. 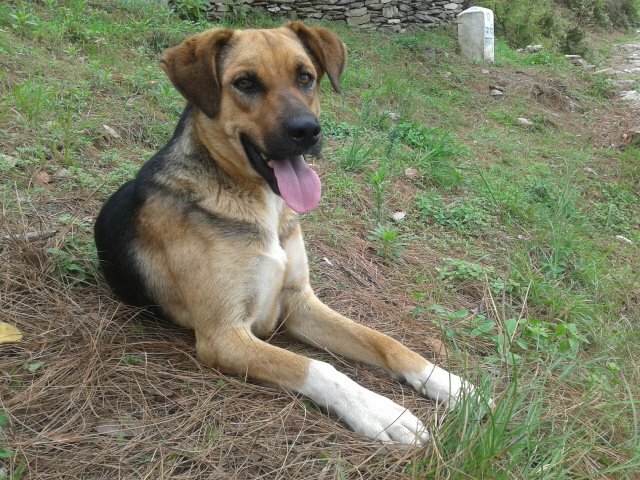 The victim’s name was Shankar and he was our second dog, which ended up as a leopard meal. None of our dogs got actually older than 18 months. “Oh, this…. leopard taking!” and then smiled. Wait a minute… WHAAAAT? LEOPARDS? I assailed him with questions and he smilingly assured me, that leopards only attack at night, from time to time they kill dogs, a goat or a young cow and NEVER eat people. Ok, this was good to know. The guesthouse had a nice big garden bordering to a slope that lead down to the forest. Its inviting fireplace was just waiting for a bonfire party. Together with the other guesthouse residents we decided to get things started. On this mellow summer evening, everyone would cook something different to create a little international buffet. We were sitting happily around the fire enjoying delicious food creations. Someone was playing the guitar and the atmosphere was pretty idyllic, when I suddenly heard a strange noise. The music stopped. Everybody paused for a moment to listen. Then out of sudden the dog started barking like crazy and raced straight into the kitchen to hide under a shelf behind the door. No need for words, just a couple of looks and everybody understood: “LEOPAAAARD!” All of us jumped up and dashed also to the kitchen, which was the nearest shelter. There we were; 8 people and a shaking dog, cramped into a tiny space, listening so hard to the sound of the leopard that we could hear our own breaths. About 30 minutes passed until we finally declared the party as over. Everybody felt uneasy and ready to go back to his room. The sound was still somewhere out there. Our room was on the upper floor, the only way to go there was crossing the big garden, passing the slope. Great! All of us upper floor guests went up as fast as possible, followed by the dog, who had decided to spend the night in our room. Lying in my bed, I felt as if I had drunk at least one liter of black espresso coffee. My eyes were wide open and I just couldn’t stop listening to the leopard sounds that were moving from one side of the slope to the other, while the dog was trembling under our bed, whining from time to time. And there was something more that kept me from falling asleep: I had to pee really badly! Maybe at this point I have to explain that many of the guesthouses here have a shared outdoor bathroom, which in our case lay on the other side of the pretty long porch. Not even in my dreams I would have left the room in this situation! I will tell you something pretty embarrassing: I came to a point when I almost cried, because things were getting really painful… as an emergency solution I emptied the waste bin and peed in there. I guess most of you would have done the same. Well, if you’re a guy, you might have used an empty plastic bottle or something like that. We lived in this guesthouse for almost a year while our own house was under construction. A couple of months after the bonfire party there was an incredible uproar coming from a gang of monkeys that had occupied our roof. I was busy cooking lunch, but I stepped out to see what was going on outside. There I stood, like numbed, with a wooden spoon in one hand and my mouth wide open; I couldn’t believe my eyes: A huge leopard was sprinting down the hill at about only 30 meters away from me! He was amazingly beautiful! And he was also tremendous! I always thought that they were about the size of a big dog, but what I saw outmatched all of my imagination! 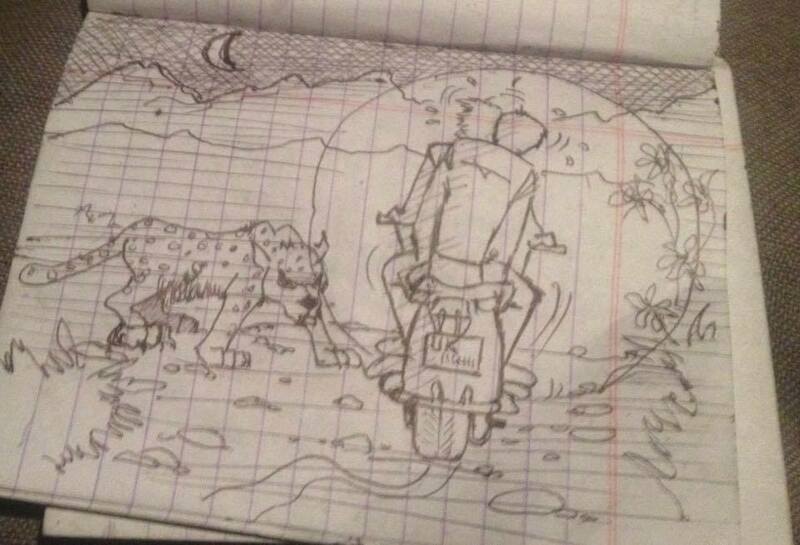 That meant that the theory that leopards only come out at night, was proved to be nothing but rubbish! 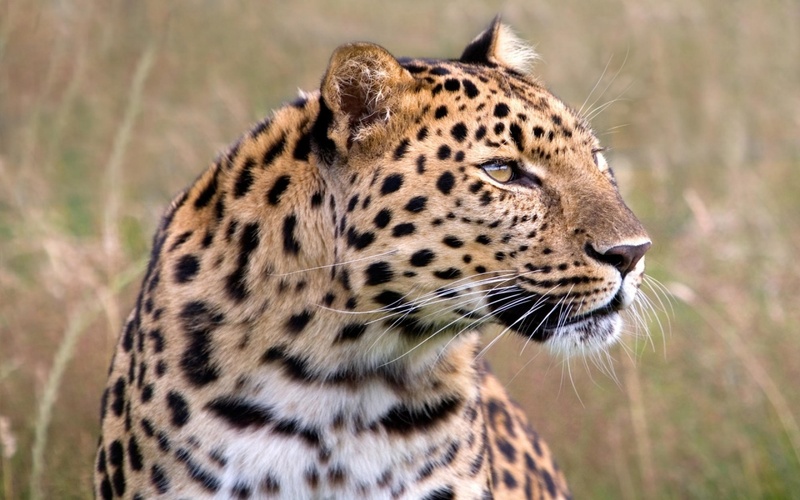 My latest leopard story dates to about one week ago. This is a village area and from time to time stories come up about leopards attacking women while working in the fields down in some valley or while cutting greens from trees for their goats. Last week a woman got killed at 3 km distance from our place. Apparently she was mentally challenged and went out to the fields by herself in the middle of the night. According to the sayings of some locals, what was left of her looked more or less like the mortal remains of our poor Shankar. Babaji, once met the forest ranger, who explained to him that there are about 20 specimens roaming through this area. This is not a small number! Anyway, I think that one has to be very, very unlucky to end up as a leopard’s dish. Most of the locals who lived here for life never even saw one. One thing I admit is that I like to be accompanied by a dog when I go out. Don’t get me wrong, I really love dogs, but still it comforts me to believe that the leopard will prefer the animal to a chewy human. When I first saw the piece of land we had bought, I wondered what kind of house could possibly fit on it; the plot looked pretty small. I thought that it might be big enough to put a larger tent on it, that’s it! It’s not that I didn’t like the idea of living in a tent or maybe a nice tipi, but after all the stories about leopards in the area we got to hear from locals and more after having seen one in full daylight I actually preferred to have four solid walls around my bed. 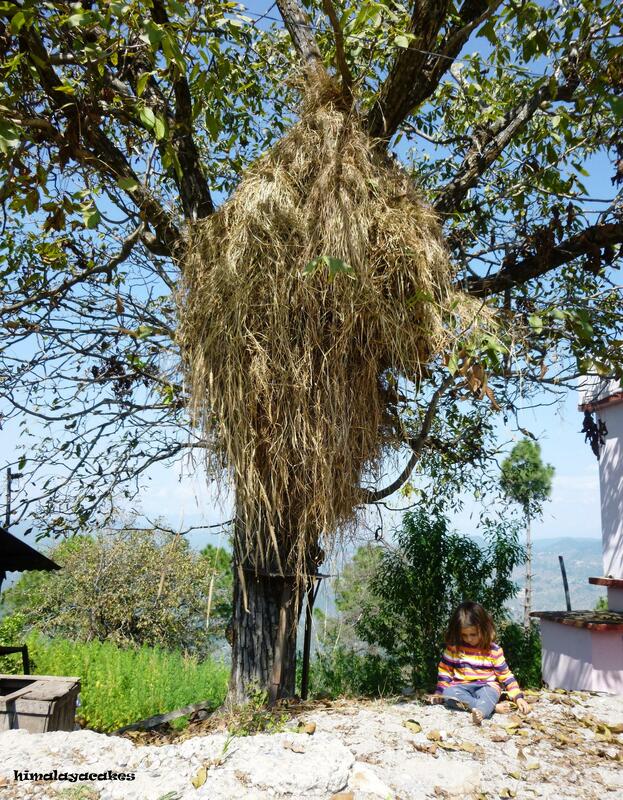 After we had all the property papers in our hands, the first thing that Baba and I did was to celebrate a small puja ceremony on the plot amidst the high grown grass and flowers, together with the tourists who stayed at the same guesthouse. 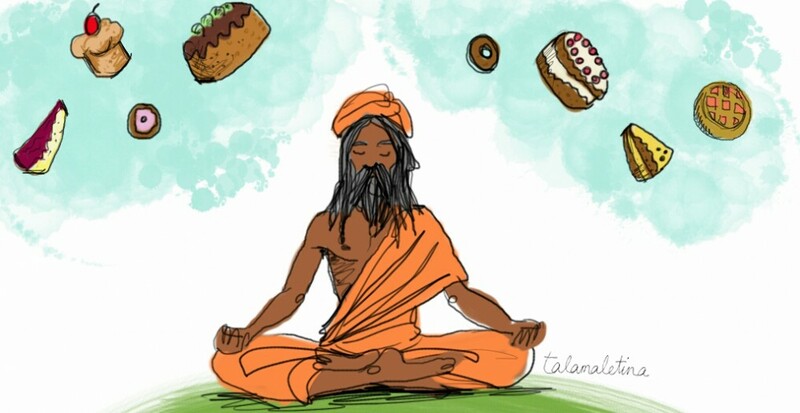 We chanted some mantras, lit incense and shared some food. YES! A REAL HOUSE COULD ACTUALLY FIT ON IT ! I never thought that I would ever have to bother about things like building a house! Until now I have always been renting the places I’ve lived in. First of all because buying a property of any kind was out of my range and second because it makes it easier to change residency whenever needed or wanted. The only thing we knew for now was that we wanted to build three rooms: One for us, a living room and one guest room. Another thing I was sure about was that I wanted to have the bathroom inside of the house and not outside like most guesthouses of the area. Having an outdoor bathroom is a good thing, but due to my earlier experience with a leopard sneaking around the guesthouse all night long, restraining me to use the urgently needed bathroom, I had made up my mind. 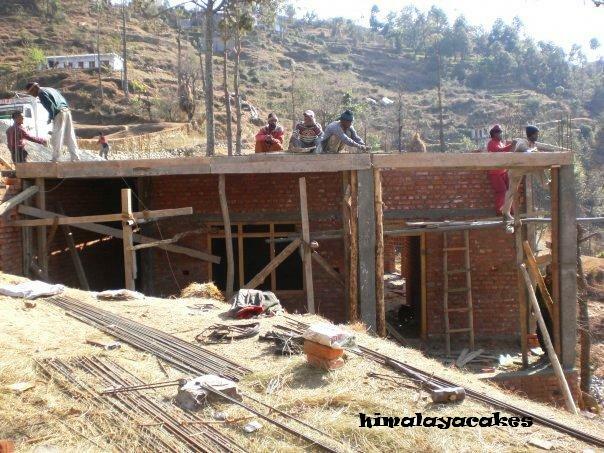 Otherwise we had no idea how people usually build a house in the Indian Himalayas. 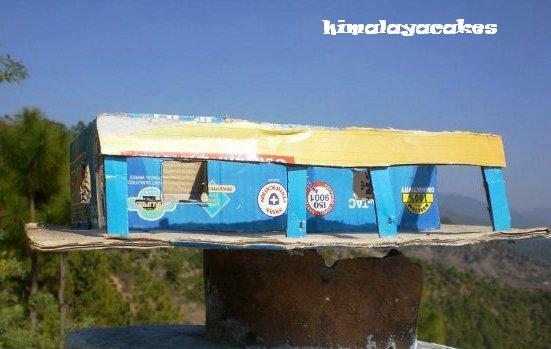 Baba tinkered a cute, roofless mock-up out of cardboard, showed it to the workers and on that base the building process started in the Indian way. He woke up every morning at six o’clock to go to the construction site to keep an eye on the situation all day long. People here are paid by day, which means that more slowly they work the more money they will get. Leaving them there alone meant that they would take things really easy and sit somewhere most of the time smoking beedis. First, my German mind had an accurate idea, about how things should be done and eventually look like. In my opinion, I explained myself very clearly and everybody seemed to understand. My main job though was to cook and bring the meal to the construction site, where Baba and I would sit and have a picnic together. Day after day when I arrived there with my tiffin, I had to discover that my plans for the house actually were not understood at all or simply completely ignored. First I tried to fight it, but after only a couple of months to not become completely crazy, my German mind surrendered to the facts of the Himalayan construction “system”. After three more months I was just happy with the thought that soon I would have a new roof over my head and had no more expectations about the result at all. 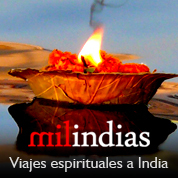 It is very popular to hire mysteries from Bihar for building projects. A mystery is the Hindi word for the head workman. I didn’t know that for a long time and as in India people are often called by their profession, I thought that it was pretty funny that so many people had such a cool name like mystery! The reasons why the workers from Bihar are very popular is that they have the reputation to be very good at their job and that they don’t drink excessively as their colleagues from the mountain area do. They also get paid more than the local workers, which usually brings jealousy issues along. Winter had come and it got pretty cold, so whenever something had to be finished the same day, the local workers demanded to get paid in addition with “Gulab” with the excuse that it helped to keep them warm. Gulab translated means “rose” and is the brand of a local alcohol that smells like battery acid. Some say that if you drink that stuff regularly you end up getting blind, which I can pretty much imagine after having tried it once out of curiosity. Well, maybe this is the reason why some of our walls have a certain angle which slightly reminds of modern art. Of course, we also had our Bihari mystery and soon one of the workers said that he wanted to receive the same salary as him. Baba explained that he would do so, if he could somehow prove that he was able to do the same work in the same time with the same quality result. One day, when I came to the building site, I wondered why the two arches on our porch differed visibly from each other. There had been a competition between the Bihari and the mountain mystery, which the latter lost! After paying day, they did not show up for a couple of days without saying a word and then reappeared as if nothing had happened.